Running in Bergen, Norway. Best routes and places to run in Bergen. Bergen is the second largest city in Norway, and is located on the country’s west coast. This small city has become an increasingly popular destination, owing to its spectacular, fjord-like setting on the North Sea. 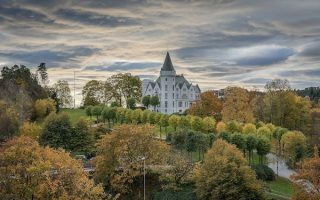 Running in Bergen is a treat, with waterfront paths around the city’s central peninsulas, and trails around the surrounding mountains easily accessed from the center or via a series of funiculars. 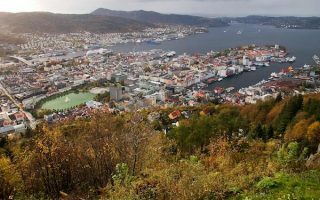 The best place to run in central Bergen are around the Nordnes peninsula, and the neighboring Bryggen peninsula. We’ve also put together a route that includes a loop around Lungegaardsvann Lake and Nygårdsparken park. Further south, there’s nice running around the park-like campus of the Gamlehaugen castle and nearby Tveitevannet Lake. The best, easier mountain running is the 4.5 km Fjellveien path, and some gentler trails at the summit of Fløyen. More serious trail runners will find endless opportunities in the surrounding mountains. Bergen is a compact city, so most of our main routes are easily reachable from the center. The ‘suburbs’ tend to be nearby islands. Public transport is extensive, consisting of trams, trolleybuses, and buses. Also note that Bergen’s weather is milder than its latitude would suggest, owing to the Gulf Stream. But it can rain a lot, so bring appropriate running clothing! The mountains do get snow, and the trails might be used more for skiing in winter. A 7 km 'runseeing' tour of some of Bergen's highlights. Run by some of the main sites in the center, the waterfront paths if the Nordnes Peninsula, and then around Bryggen Wharf out a medieval tower and fortress. A very pretty 5k run including a loop around Lungegårdsvann Lake, Nygårdsparken (park), and the small campus of Bergen University. Easily accessed from the center. Some nice running around the park-like paths of the historic castle of Gamlehaugen. There are also paths that extend for ~2 km north and south from Gamlehaugen, and just east, a nice loop around Tveitevannet lake. 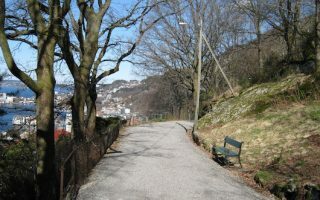 A great introduction to some to some of the hills above Bergen, this wide, pedestrian-only path runs along the ridge just below Fløyen for 4.4 km. Generally flat and wooded, with some great views. Can be reached from the center or via furnicular. There's some very nice running in the hills immediately surrounding Bergen. The trails at the top of Fløyen offer something for everyone. Reached by funicular. For a lung buster, take the 800 stairs off Fjellveien to the top of Sandviksfjellet. Great views! For running in Bergen, bring layers and wet weather gear! 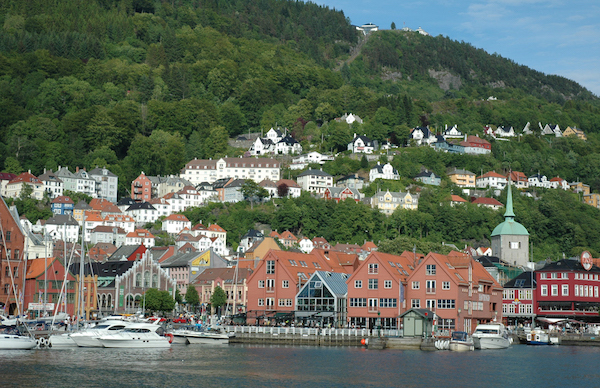 Bergen has an oceanic climate, influenced by the Gulf Stream and surrounding mountains. Winters are milder than the latitude would suggest, with temperatures hovering just above freezing by day and just below it by night. Summers are mild, with high temperatures reaching 19-20C (68F), and cool-ish nights. 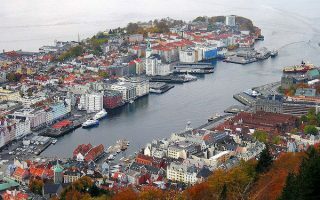 Precipitation is a major factor in Bergen: there are nearly 2,500mm (90 inches) of rain annually, and plenty of snow in the surrounding mountains. Precipitation occurs on some 2/3 of days. Note also the short winter and long summer days. 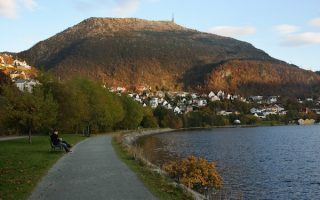 There are numerous running and outdoor sports stores in Bergen. Many of the stores are ‘multi-sport’ stores that have gear for running, trail running, and other sports. See the overview map on the Bergen home page for locations. Bergen Marathon. Great race, held in April.